The reports have confirmed that Microsoft is working on a foldable mobile device codenamed Andromeda (often referred to as Surface Phone). The mythical device will have two different display and it would run on Microsoft’s Windows Core OS. The reports have confirmed that Microsoft is working on a foldable mobile device codenamed Andromeda (often referred to as Surface Phone). The mythical device will have two different display and it would run on Microsoft’s Windows Core OS. While such a device from Microsoft is still nowhere to be seen, Asus, on the other hand, has today presented the Precog, a new laptop-sized device with support for multiple form-factors. If Asus launches the Precog this year or early next year, it would become the first laptop to support multiple form factor with the large 15-inch display. Asus Precog concept is similar to Microsoft’s rumoured foldable Andromeda, but the key difference is the form-factor and target audience. The Precog also combines two different displays but the device is still in laptop form-factor. Asus’s new innovative device is aimed at the professionals and businesses as you can connect it to a PC and use it as a second monitor when the position of the device is flat. Furthermore, it can be also used to demo the projects and you’ll be able to draw on the screen in the tent mode. Interestingly, the Asus Precog also offers several form factor and it’s likely that the device will run Windows 10 or Windows Core OS. This laptop also uses a hinge to attach two displays, and it supports several form factors, including traditional laptop mode. You can use Precog as a regular laptop as well. 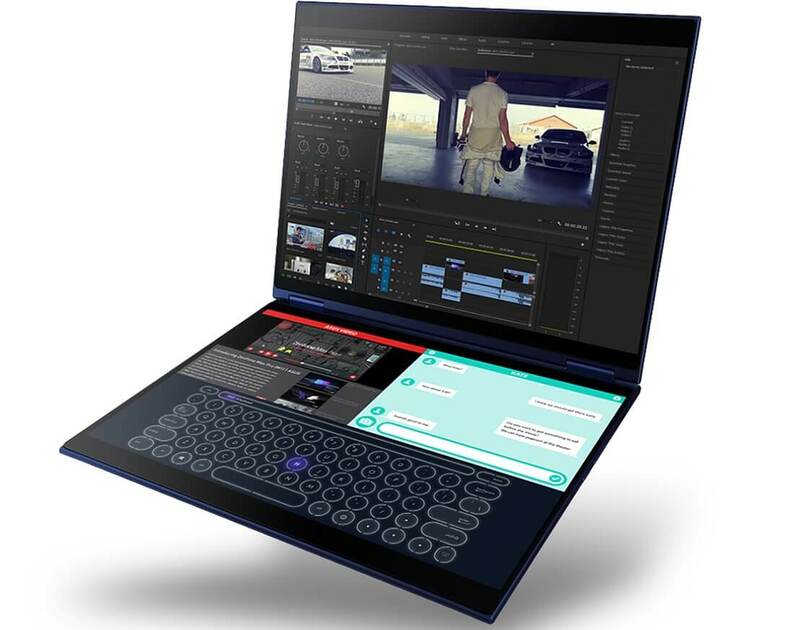 Just like Lenovo Yoga Book 2, one screen of the device would become a digital keyboard. The device is basically using two different displays, one can be used as a keyboard, and the other as a screen. Interestingly, the role of the screen and keyboard would change depending on the angle and the position of the two screens. Asus’ innovative technology allows the hardware to automatically change the role of the displays. Asus Precog also features super-innovative technologies including Intelligent Touch feature, it allows you to configure the device. Furthermore, the interface would change when the orientation and form-factor of the device are changed. By the looks of things, the innovative device would run Windows Core OS, a modular operating system. Windows Core OS is said to be to the first OS to feature an adaptive shell. Asus hasn’t yet announced the release date, but there’s a good chance that the company will unveil the Precog later this year.